Ms. Weir is the University Librarian at the University of Ottawa, a role she has held since 2003. Prior to her tenure at the University of Ottawa, she held positions at the National Library of Canada and the Statistic Canada Library. A recipient of the CLA Ken Haycock Award for Promoting Librarianship, Ms. Weir’s contribution and dedication to librarianship is demonstrated in large by her service and leadership in numerous associations and committees provincially, nationally, and internationally. Ms. Weir was instrumental in the development and continued success of CRKN starting in 2002 when she joined the Canadian National Site License Project (CNSLP) Steering Committee, the precursor to CRKN. Ms. Weir worked closely with the CNLSP Steering Committee and staff on the formation of the new organization, eventually leading to the incorporation of CRKN. She was a member of the Board of CRKN, from its inception until 2009 and again from 2011 to 2015. Ms. Weir is lauded throughout the community for her leadership and networking skills, always working tirelessly to ensure success and overcome any challenges. 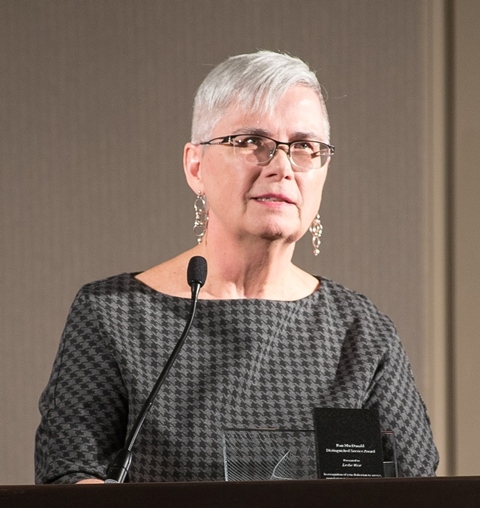 Over the course of her career, she has demonstrated vision, dedication, and outstanding service by fostering relationships both within and outside of the world of librarianship, often working with scholarly publishers, funders and others to encourage collaboration to advance knowledge infrastructure in Canada. For more than 30 years, Ms. Weir has established new relationships within the CRKN membership and across organizations and sectors, and she has been a champion of knowledge infrastructure in Canada. During a period of extraordinary change in the field of librarianship, she acted as a guide in many of the transformative moments experienced by CRKN and research libraries in Canada and beyond. 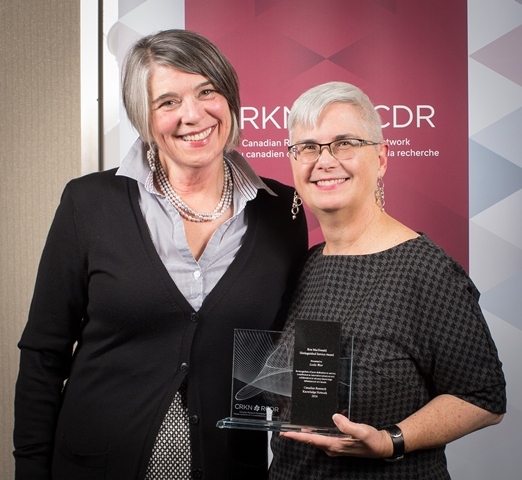 On behalf of the CRKN Board of Directors, we congratulate Ms. Weir on her many achievements across her 30 year career and the widespread effects of those contributions on librarianship as a whole. 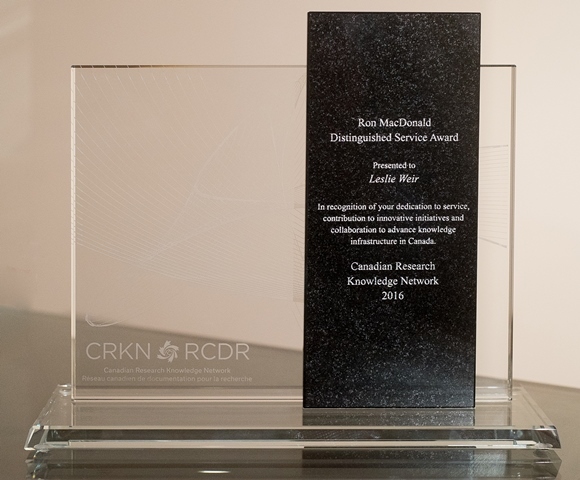 The Canadian Research Knowledge Network is a partnership of Canadian universities, dedicated to expanding digital content for the academic research enterprise in Canada. 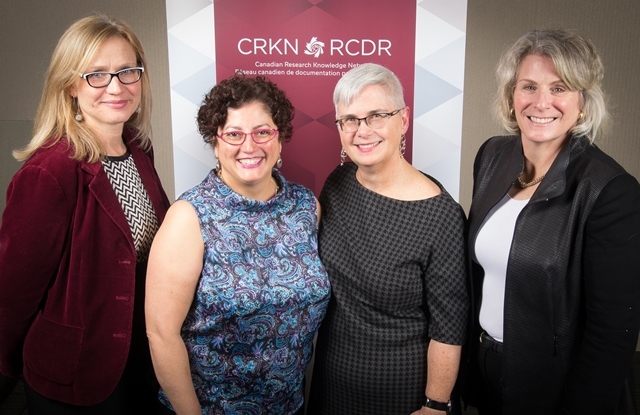 Through the coordinated leadership of librarians, researchers, and administrators, CRKN undertakes large-scale content acquisition and licensing initiatives, licensing over $1.07 billion in content since 2000, in order to build knowledge infrastructure and research and teaching capacity in 75 of Canada’s universities.